French scientists have created a material with convention-defying magnetic properties. 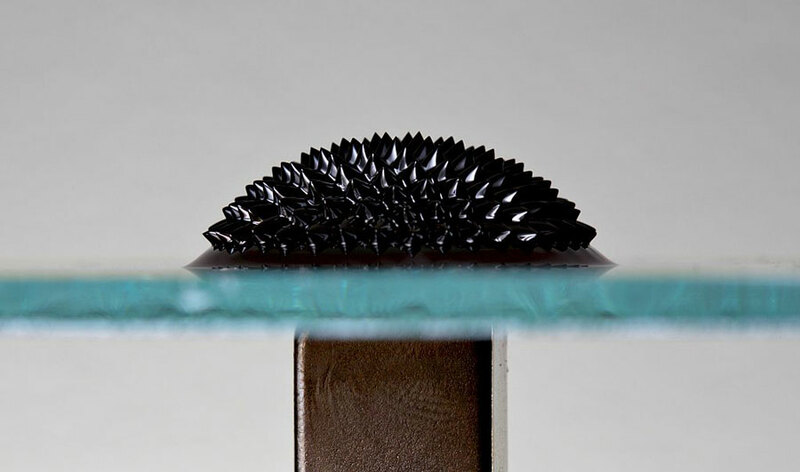 A blob of magnetic fluid that helps to visualize the magnetic field lines generated by the magnet underneath. (Inside Science) -- Scientists have discovered a new way to manipulate the magnetic structure of certain materials to form a kind of magnet known as fragmented spin ice. The resulting material possesses some of the weirdest magnetic properties known to science. Researchers are still trying to figure out exactly how these weird magnets behave, and learning to harness them could one day lead to novel applications. The discovery was published last month in the journal Nature Communications. Inside every material there are magnetic and nonmagnetic atoms. While both are essential for determining the material's many properties, the magnetic atoms control the magnetic properties. Acting like individual tiny magnets, the magnetic atoms collectively determine the overall magnetic properties of the material, which depends on the strength and coordinated orientation of each of these tiny atom-sized magnets. This is how we get a fridge magnet that behaves differently from the surface of the fridge. And it's why both differ when compared to the plastic fridge handle. The strength and orientation of the tiny magnets within each of those three items are closely related to a fundamental property of individual nuclei and electrons known as spin. Because of this close relationship, sometimes scientists simply call the tiny magnets "spins." In spin ice the tiny magnets, or spins, are arranged in a very specific way. Unlike most magnetic materials, which take up relatively straightforward formations, such as lining up along a single direction, or just pointing in random directions, the individual spins inside a spin ice material have no simple way to organize themselves. This is usually due to the geometric arrangement of the atoms themselves -- when the atoms are put together in a certain way, the individual spins simply can't find a position that's consistently comfortable, as if they're trying to fit together like a bunch of badly built floor tiles. Scientists call these materials "geometrically frustrated magnets,” where the spins are stuck or frozen in complex but still somewhat regular patterns. Sometimes these spins form a structure that resembles the molecular structure of ice, hence the name -- spin ice. "Back in the '80s, people thought that these frustrated magnets [were] the keys to superconductivity," said Ludovic Jaubert, a materials scientist from the University of Bordeaux in France. He is not involved in the new research. Although some scientists today are skeptical of the connection between the two properties, frustrated magnets remain an area of keen interest, said Jaubert. The new paper, written by a group of European scientists, describes a new way to manipulate and study these materials -- by breaking up their magnetic structure without destroying their physical structure. The scientists found that when they inserted magnetic atoms in place of certain nonmagnetic atoms inside a spin ice material, the newly inserted atoms would form their own magnetic network that could "break up" the frozen spin arrangements of the spin ice. This allowed some of the spins to rotate along certain axes, but not in others. It’s as if the spins are behaving like a freely flowing liquid along some directions and like a solid along others. "If you consider a similar 'fragmented' state with water or ice, what would happen when you pour it? Will it fall like a solid? Or will it flow like a liquid?" said Rafik Ballou, co-author of the paper and a materials scientist from Institut Néel in Grenoble, France. Just like in Schrodinger's famous, paradoxical thought experiment, in which it is difficult to state whether the poor cat-in-a-box is alive, it is difficult to predict the magnetic behavior of a fragmented spin ice. "Like many problems in quantum mechanics, it's difficult to conceive [of] this visually," said Virginie Simonet, also a materials scientist from Institut Néel and a co-author of the paper. Looking beyond magnetism, Simonet wonders whether similar types of bizarre behavior might also be found in other materials, creating materials that physically possess liquid and solid properties at the same time. If this is true, it would open up a whole new world of materials for scientists and engineers to explore. "There is no application right now, but now that these experiments can actually be done, it can be a possible direction that will lead to applications," said Jaubert.